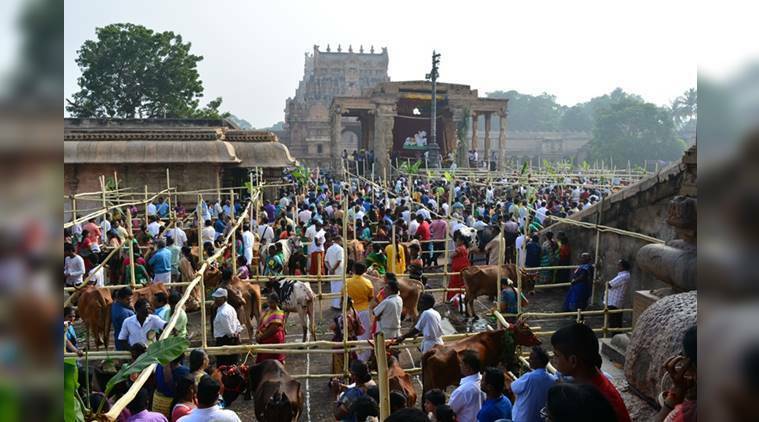 Bulls, both in play and worship, are inseparable from Pongal celebrations in Thanjavur. At the colossal Brihadeshwara Temple, the grandest among the temples in India built by Raja Chola I in the 11th century, a Unesco World Heritage site located in Thanjavur city of Tamil Nadu, the throng outside waits for their turn to enter the temple. Twelve-year-old Bala stands outside the gopuram, the temple’s entrance tower. He holds the loose end of the rope, the other end of which is harnessed to a bull. The strong white bull has a huge vermilion mark on its forehead. A garland and a bell hang from its neck. Festoons flutter from its capped horns. Looking freshly bathed, it chews away on the cud. Bala is not the only one; there are scores of others in the queue. The occasion: Pongal celebrations. The four-day Pongal festival coincides with Makar Sankranti celebrations in January. The first day of the festival, known as bhogi, is marked for cleaning the house and decorating its entrances with rice powder kolam or rangoli made with dried and coloured vegetables and grains. The main festival is celebrated on the second day; the third day is celebrated as Mattu Pongal. With mattu meaning bull in Tamil and ponga meaning the abundance of rice, the festival honours the toil of bulls in ensuring good harvest. Every year, farmers assemble at the temple to offer prayers and seek blessings from Goddess Parvati, Lord Shiva, Lord Ganesha and Lord Krishna. As I enter the temple complex on the third day, I walk into a congregation of 108 (an auspicious number in the Hindu religious texts) bulls and cows. Wisps of incense smoke and the aroma of camphor and ghee, pervade the air. The farmers and their cattle stand inside a bamboo pen, as priests perform a yajna. The monolithic 13-feet Nandi bull sits facing the garbha griha of the shrine. Vegetables and fruits that cover every inch of its surface are later distributed among the devotees. Sakara pongal, porridge made with rice, moong dal and jaggery, is offered to the cattle as feast of the day. Later in the day, men play a game of jallikattu. A money bag is tied to the horns of the bulls and men chase the bulls to win the bag. There is a mythological lore behind how bulls came to plough the fields. Apparently, Lord Shiva sent Nandi to earth with the message that its inhabitants must have a hot oil bath every day but eat food once a month. Instead, Nandi asked them to bathe once a month and consume food daily. Livid at Nandi’s folly, Shiva sent him to earth to help generate extra food. It may have been a punishment for Nandi, but if we continue to acknowledge the bull’s hard work, Nandi will keep blessing us with bounties of crop. This article appeared in print with the headline ‘Bullish About Life: Bulls are inseparable from Pongal celebrations in Thanjavur’.